Who’s in charge? Certainly not the bought-and-paid-for-moderates that Washington and the EU hoped to install as the new government of Ukraine. The agreement that the Washington and EU supported opposition concluded with President Yanukovich to end the crisis did not last an hour. Unlike the US orchestrated toppling of the stature of Saddam Hussein, which was a PR event for the presstitutes in which Iraqis themselves were not involved, Ukrainian rightists’ destruction of the monument commemorating the Red Army’s liberation of the Ukraine had public support. If the Right Sector hates Russians for defeating the Nazis, the Right Sector also hates the US, France, and England for the same reason. The Right Sector is an unlikely political party to take Ukraine into the EU. The Russian parts of Ukraine clearly understand that the Right Sector’s destruction of the monument commemorating the stand of the Red Army against the German troops is a threat against the Russian population of Ukraine. Provincial governments in eastern and southern Ukraine that formerly were part of Russia are organizing militias against the ultra-nationalist threat unleashed by Washington’s stupidity and incompetence and by the naive and gullible Kiev protesters. 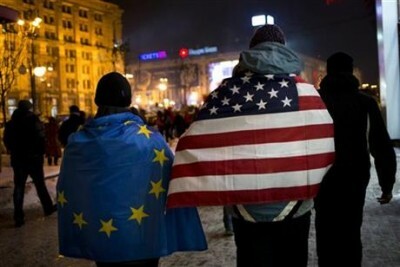 Ukraine is far more important to Russia than it is to the US or EU. If the situation in Ukraine spirals out of control and right-wing extremists seize control, Russian intervention is certain. The arrogant and stupid Obama regime has carelessly and recklessly created a direct strategic threat to the existence of Russia. Most importantly, well-meaning but stupid protesters–especially the Kiev students–and an Ukrainian parliament playing to the protesters destroyed Ukrainian democracy. The opposition controlled parliament removed an elected president from office without an election, an obvious illegal and undemocratic action. The opposition controlled parliament issued illegal arrest warrants for members of the president’s government. The opposition controlled parliament illegally released criminals from prison. As the opposition has created a regime of illegality in place of law and constitutional procedures, the field is wide open for the Right Sector. Expect everything the opposition did to Yanukovich to be done to them by the Right Sector. By their own illegal and unconstitutional actions, the opposition has set the precedent for their own demise. Just as the February 1917 revolution against the Russian Tsar set the stage for the October 1917 Bolshevik Revolution, surprising the stupid “reformers,” the overthrow of the Ukrainian political order has set the stage for the Right Sector. We can only hope that the Right Sector blows its chance. Americans have no idea that the neoconservative regime of the White House Fool is leading them into a Great Power Confrontation that could end in destruction of life on earth. Ironic, isn’t it. America’s “first black president,” the person liberals thought would restore justice, morality, and reason to Western civilization, is instead now positioned as the person who will have to accept humiliating defeat or risk the destruction of life on earth.